Our family ran into this beautiful family 2000 meters up in the mountains yesterday and it was the highlight of our trek. It’s always lovely meeting a fellow mother in the mountains, and this one also had two children who were basking in the sun and enjoying the fresh air (as were my own!). 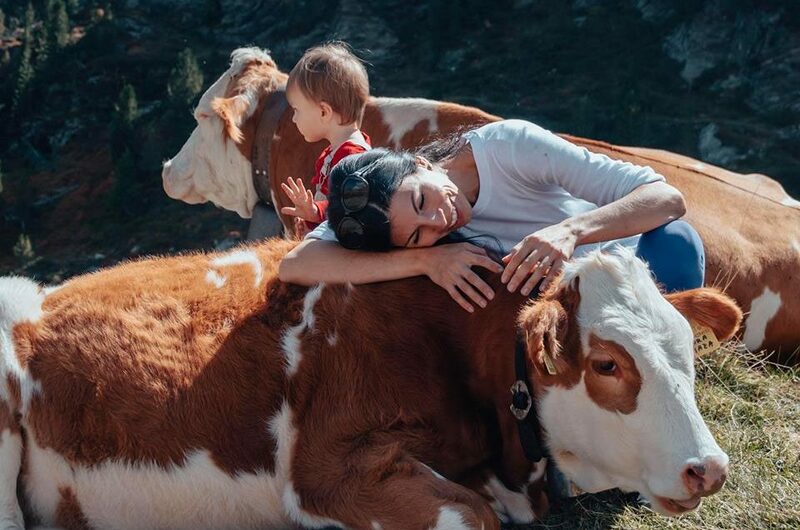 Every time I meet a cow mother and her children, I am always greeted with such kindness. My children, who have been taught to respect animals of all kind, were giddy with excitement when the baby cows licked their fingers. Mother cow stayed close by and watched their every move with keen observation but also with trust in her eyes. We cuddled, we scratched behind the ears, and we sat and joined them for our favorite past time of all; overlooking the mountains of our stunning country. I am a strong believer that the World would be a much kinder place if we all spent more time with our animal friends. If we allowed them the freedom to love, roam, and care for their own families, as we have the freedom to do with our own. We are not better than these animals. We do not have the right to hurt them for any reason. They just want to love as we love and they want to be loved as we want to be loved.